If you're travelling past Gateshead, whether by car on the A1, or by train on the East coast main line, you can't miss the Angel of the North. 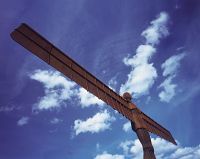 At 20 metres tall, with a 54 metre wingspan and weighing 200 tonnes, the Angel is Britain's largest sculpture and towers over the Team Valley from its hilltop site. In 1994 Gateshead Council chose Turner prize-winning artist Antony Gormley OBE to produce a sculpture as a symbol for Tyneside. Funding was secured in 1996, and the giant sculpture was erected on site in 1998. The Angel of the North is as much a feat of engineering as a work of art. The sculpture has a greater wingspan than a Boeing 757, and has to be able to withstand winds of over 100mph in its exposed location. This required a complex construction with an internal 'skeleton' and sheet steel of varying thickness. 150 tonnes of concrete were used to create foundations which anchor the sculpture to the rock 20 metres below. Created in three parts - the body weighing 100 tonnes, and two wings weighing 50 tonnes each, the Angel was transported on three huge lorries, before being assembled on site. The wings are not flat - but are angled 3.5 degrees forward, which Gormley says was to create "a sense of embrace". The sculpture cost nearly £800,000 - which has been controversial in a relatively deprived area of Britain. Nevertheless, there is no doubting that Antony Gormley has created a powerful landmark which is seen and enjoyed by tens of thousands of people every day. Although the Angel of the North can be seen from miles around, you have to visit the site itself and stand at the feet of the giant to truly appreciate the scale and majesty of this most recognisable of England's landmarks. Heading South on the A1 continue past Newcastle and Gateshead. Take the slip road marked Wrekenton and Birtley. At the roundabout, take A167 exitsigned Gateshead South. After a few hundred yards the Angel site is a few hundred yards along this road on the left. Parking is available nearby. Heading South on the A167, travel through Low Fell and continue south until you reach the roundabout leading to the A1. Drive all the way round the roundabout and take the A167 exit back towards Gateshead South. After a few hundred yards the Angel site is on the left. Parking is available nearby. Heading North on the A1, take the A167 exit signed Gateshead South. At the roundabout take the A167 turn off. After a few hundred yards the Angel site is on the left. Parking is available nearby.